We train every Wednesday and play every second Sunday. See what's it's all about. 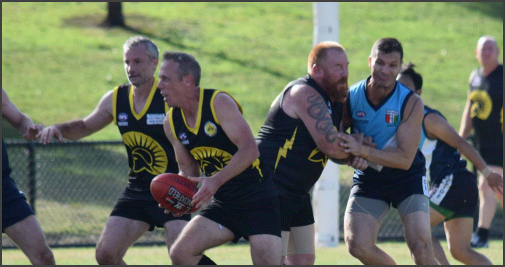 If you like footy, if you like a yarn with mates, then we know you'll like the AFL Supers Comp. Be there next Wednesday 6.15pm. Check the calendar for the next date and location. Don't let the looks fool you. These are some of our cream of the crop, finely-tuned Warriors teammates ready for AFL action. Which player most resembles you? 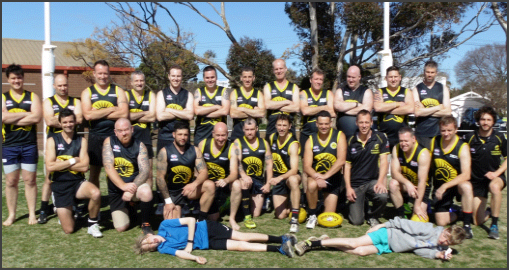 Whether you've played footy before or not, join us for some fun. You get what you put in. Most of us hate gyms. Why not get fit the enjoyable way? Play footy with your mates. We're all a bit older & wiser now. Our priority is to enjoy first & win second.. Share the highs & lows with your mates. It's not just about footy. Enjoy the many events throughout the season and don't forget the end of season footy trip. Congratulations to all award recipients for 2018.